Suffolk County Police Marine Bureau officers recently rescued a Babylon man from the Fire Island Inlet after his boat overturned in heavy seas. Marine Bureau Officer Erik Johnson, patrolling the oceanfront at Democrat Point on Fire Island, spotted the overturned hull of a boat in the inlet. Officer Johnson notified dispatch and a police helicopter and two rescue boats were dispatched to the area and the United States Coast Guard was notified. 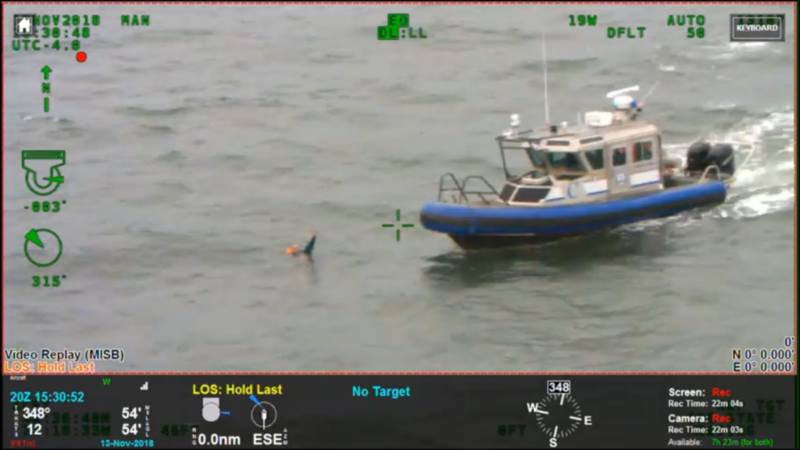 Marine Charlie, with Sergeant John Vahey and Lieutenant Edward Mulroy aboard, with the assistance of the Suffolk County Police Aviation Unit, located Greg Antolini, who was clinging to a life jacket, pulled him from the water and rendered First Aid. Antolini, 54, was transported by Suffolk Police Helicopter to Stony Brook University Hospital for treatment of hypothermia. A Small Craft Warning was in effect at the time of the incident and the water was 57 degrees.